We understand that fire safety regulations are highly regulated and technical, proving sometimes to be a difficult area to manage. Your fire equipment service provider should be proficient and knowledgeable in fire safety rules and regulations, rendering you reliable, professional advice and guaranteeing your absolute safety and compliance. We also understand the value of your fire equipment. The expenses involved with the installation, maintenance and replacement of your equipment can be daunting. You need to know that you are being guided correctly by your fire equipment service provider and are being charged at a reasonable and honest rate. Be aware of the importance of having your fire equipment serviced by a reputable and honest organization. There are many fly by nights who will service your equipment at cheaper rates promising you compliance. These service providers are not certified maintainers of fire equipment. The pennies saved on your annual service could be your most expensive decision ever made. Make sure that your Fire Equipment Service Provider is accredited by the SAQCC and SANAS. All technicians should have membership cards with valid dates proving their legitimate right and responsibility to service your equipment. 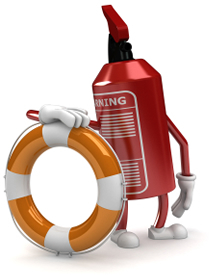 We are trained experts in the installation, maintenance and compliance of Fire Equipment. Our workmanship and manufactured products are of the highest standards, ensuring that your equipment works when needed. Our goal is to make the installation and maintenance of your fire equipment an easy task to manage and your comfort that your fire equipment is taken care of. We are fully accredited by the SAQCC and SANAS making us a preferred supplier and maintainer of Fire Equipment. Drawing up and implementing Planned Maintenance Systems into operation. Periodic inspections of Planned Maintenance, in order to ascertain that the work is being carried out as specified. Providing CAD drawings for all work handled by us. Carrying out inspections of all the above types of work and providing detailed reports.